You may wonder why, if The Bomb-itty of Errors (produced by Temporary Thing and Twenty Something Theatre) closed already I’m reviewing it? Well, because I think it deserves a special blog post (I wrote about it when I previewed it with a tickets giveaway, but it is definitely worth talking about). I wish I had attended The Bomb-itty of Errors MUCH earlier in their run (my life is hectic, and people probably get bored of me telling them that it is crazy, but that’s a sad reality of living two lives at the same time). But I’m glad I did attend, before the run was over. JT and I arrived to Studio 16, which is an intimate studio/auditorium right in the building of Café Salade de Fruits, a wonderful French bistro in the South Granville area. When we got into the building, we realized that the format of The Bomb-itty of Errors was going to be unique and different. In this project, produced by my friend Sabrina Evertt of Twenty-Something Theatre fame, the audience was encouraged to purchase drinks, sit down and enjoy the show (as though it was a musical show that you would watch at say, The Commodore). I now understand why this strategy worked so well (the night I attended The Bomb-itty of Errors the studio was a completely sold-out, full house). Going against my usual perception of the projects that both of them tackle, Director Catriona Legler (whose work I love) and Producer Sabrina Evertt offer us an incredibly fast-paced, absolutely hilarious and never-a-dull-moment, entertaining production where the Shakesperian Comedy of Errors is reinvented as a showcase of dexterity, costumes wizardry, agility and hip-hop/rap singing. The Bomb-itty of Errors is a fast-paced, energetic, musical “ad-rap-tation” of William Shakespeare’s The Comedy of Errors. 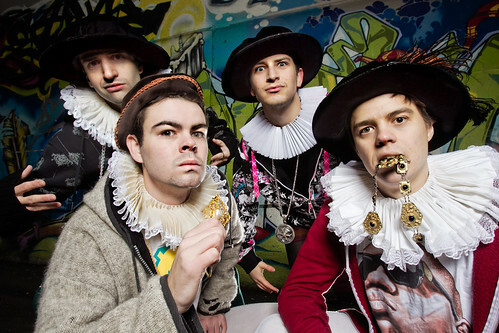 Elizabethan times get pumped up with live hip-hop flavour, as the actors sing, rap and rhyme fun, catchy, and laugh-out-loud songs that retain much of the bard’s original text – all with a live DJ on stage and original music by Anami Vice. Starring Brian Cochrane, David A. Kaye, Niko Koupantsis and Jameson Parker. All four actors deserve kudos, although I’ll admit I have always been partial to the work of Jameson Parker. Brian Cochrane and Jameson Parker are, from what I heard on the day of the performance, the crazy kids who decided to approach Sabrina with this project, and I’m glad they did. Catriona does, as she usually does, her thing and is able to extract like-ability, powerful energy and a fascinating mimetic ability from each of her actors. Kudos as well for the multiplicity of costumes and the ability to hold each persona separate from each other. AND… the live music was phenomenal. And how could I forget the fact that each and every act was sung in rap?! Overall, I really hope that Theatre Twenty-Something and Temporary Thing produce another play like this. As I commented on Twitter, we have some of the most amazing theatrical talent in Vancouver, and I hope audiences in this city reward them. And I’m excited for what this city’s theatre can produce. Fighting Chance Productions are now doing some serious stuff and Theatre Twenty-Something is producing musicals. WHAT NEXT? I can’t wait to find out! Disclosure:JT and I attended on media tickets generously provided by the theatre company. However, I would completely have paid for my own admission as the show was fantastic. As always I retain full editorial control over what I publish on my site.